A musical featuring the songs of Ronnie James Dio will see its world premiere in Australia this March. 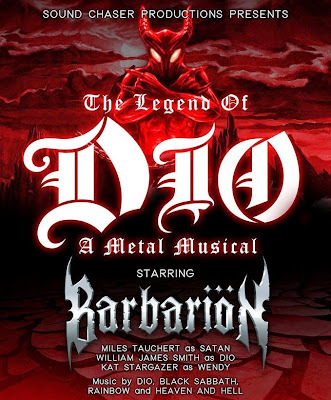 “The Legend of Dio – A Metal Musical” – a fictional comedy based on Dio's music, lyrics and imagery – will include material from Dio, Black Sabbath and Rainbow as presented by members of three Melbourne-based bands. Billed as “equal parts Tenacious D, Rock of Ages and Shakespeare,” the musical stars William James Smith from H.M.A.S. Vendetta as Dio, Barbariön frontman Myles Tauchert as Satan and Kat Stargazer of Horizons Edge as wife/manager Wendy Dio. “The Legend of Dio – A Metal Musical” will debut on March 6 at The Corner Hotel in Richmond; more details are available at the musical’s Facebook page. Dio died of stomach cancer on May 16, 2010 at the age of 67. The 2014 Ronnie James Dio tribute album, “This Is Your Life”, leads the nominations in the Best Metal Performance category at the 57th Annual Grammy Awards in Los Angeles next month. Anthrax’s version of Black Sabbath’s “Neon Knights” and Tenacious D’s remake of Dio’s “The Last In Line” go head-to-head alongside tracks by Motorhead (“Heartbeaker” from “Aftershock”), Slipknot (“The Negative One” from “.5: The Gray Chapter”) and Mastodon (“High Road” from “Once More 'Round the Sun”).